Ujwal DISCOM (Distribution Companies) Assurance Yojana was launched by Ministry of Power, Government of India on 5th November 2015. To facilitate financial and operational turn around of power distribution utilities of India this scheme attempts to buffer their finances. Till now 32 states and UTs have joined this scheme, and the only states that opted out are Orissa and West Bengal. 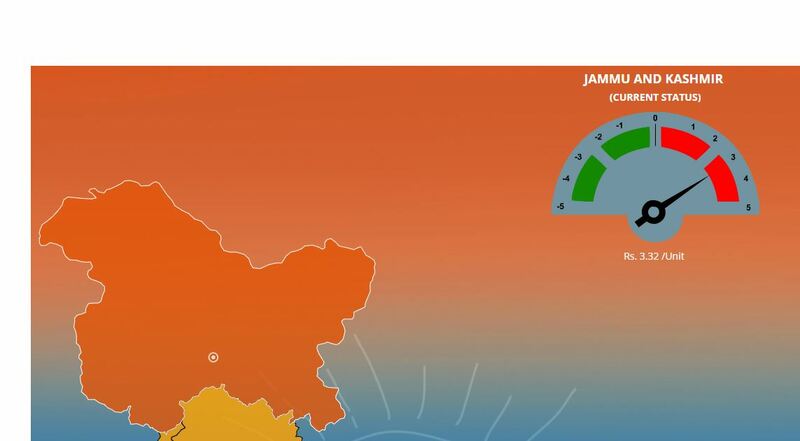 States like Karnataka, Gujarat, and Maharashtra have been ranked well above the not so well performing states of Bihar, Telangana and Jammu and Kashmir. In Jammu and Kashmir, the ACS-ARR gap is more than 3 rupees per unit that needs to be improved. For some apparent reasons like inefficiencies in power distribution by state DISCOM and political pressure by the state governments on DISCOMs, state DISCOMs have been supplying electricity at tariffs that are far below the supply cost. This results in DISCOMs accumulating losses which lead to a reduction in electricity bought from power-generating companies and cut down supply to consumers. Consequently, power generating companies have suffered a fall in demand and the banks that lend money to them accumulated NPA. Now to revive this mismatch in demand and supply and also the bank’s NPA, the government introduced UDAY yojana. As per the statistics between 2011-12 and 2014-15 outstanding debt for this sector shot up from INR 2.4 lakh crore to INR 4.3 lakh crore with 15 % interest rate. Under UDAY yojana government announced that it would take over three fourth of DISCOM’s debt and remaining one fourth will be funded by the government through UDAY bonds (Bond issued by the government to banks to generate money for UDAY yojana) or it will be converted into low interest loans by leading banks. In return, DISCOMs will be given targets which they are required to complete in a given time frame. A report published by Rating agency Crisil in Dec’18 said that by the fiscal year 2018-19 UDAY yojana could reduce the power companies’ losses by 50% and it will also lead to a capital saving of INR 12000 crores. A report published by power ministry expresses that most participating states took over the debt of utilities improving liquidity situation reduction in aggregate technical and commercial losses (AT&C). A research done by national institute of public finance and policy expresses that DISCOMs can only convert their loans into government bonds if they reduce the average Aggregate Technical and Commercial losses (AT&C) to 15 % by 2018-19 but as per UDAY portal average AT&C losses stands at 19.71 % and only seven states has the capability to reduce their losses below 15 %. The author also finds several operational inefficiencies like billing procedure, measurement of power consumption and ineffective monitoring of power theft. As per the unaudited data on the government’s website, the ACS (Average Cost of Supply per unit of power) – ARR (per unit, Average Revenue Realized) gap which was about 0.70 rupee in 2011-12 reduced to 0.35 rupee in 2018-19. The government has already issued bonds of INR 2,32,163 crore, and INR 2,69,056 crores remain to be released. Distribution Transformer Metering work is still about 80 % in urban and 60 % in rural areas. Smart Metering is at a dismal 2 to 4 %. 70 % of feeder segregation has been achieved. Consumers can pay full price, and state DISCOMs can charge the total expense of electricity supplied, and the government can pay the subsidy to consumers directly so that DISCOMs are protected from any financial crisis. India’s AT&C losses are approximately double of global average so state government should focus to reduce this by doing some structural reform. State DISCOMs should be provided with sufficient institutional safeguards so that they would not be prone to state government pressure. The DISCOMs can be ranked, and the funds should flow to them based on their rankings. Central government should give warning to states who are not showing enthusiasm in completing their target and could link target with some incentives.